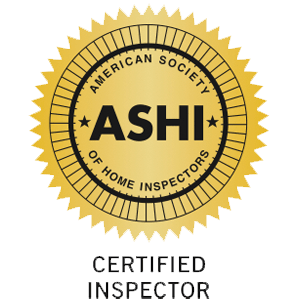 Perhaps the first thing you should do when choosing an inspector is to be sure they are an ASHI Certified Inspector. However, this is just a start. I would say it would be the bare minimum requirement. ASHI is the oldest and largest Home Inspection organization. It is also the only home inspectors association that can truly “certify” their inspectors. Most people don’t know this but there is a very rigorous, complex process established by the NCCA The National Commission for Certifying Agencies, to officially call your association members “Certified”. More information about this process is below. There are no federal laws governing home inspectors. We are regulated only by the individual states. Since the laws vary from state to state – and some states don’t have home inspection regulations – how can you be sure that your inspector is qualified, experienced, and trustworthy? One way is to be sure your inspector is a “Member” of the American Society of Home Inspectors (ASHI). There are a number of home inspector associations/organizations and it can be confusing for the home buyer to decipher which ones are legitimate and which ones are bogus. Most of them require minimum to no training, education, experience, and adherence to ethical standards. ASHI is the oldest and largest home inspector association. It has the strictest Standards of Practice and more importantly the toughest Code of Ethics. You can become a “Certified Home Inspector” with virtually no inspection experience with many of the organizations. ASHI is the toughest association to become a member of. Among many other requirements, you are not a “Member” of ASHI until you have completed 250 fee paid inspections. Additionally, a representative number of those 250 inspection reports are reviewed by ASHI to determine if they meet the standards of practice. There is only one other association that comes close to this (The National Association of Home Inspectors NAHI) and they require only 100 inspections to become a member. Right out of the box, an ASHI inspector is two and one-half times more experience than any other association requires. I can not think of any other profession where the old saying “there’s no substitute for experience” applies more than home inspections. Along with nearly 5 decades of experience, numerous certifications in many home inspection related fields, as a member of the American Society of Home Inspectors (ASHI), you can be assured that not only am I qualified, but I also adhere to the association’s standards of practice and code of ethics. See also “Inspector Profile” section of this site. You can find more information about ASHI at their website, www.ashi.org. The American Society of Home Inspectors (ASHI) has been approved by the National Commission for Certifying Agencies (NCCA) as a recognized accrediting association for its profession-leading Certified Inspector Program. ASHI is now the only accredited home inspection association whose full members have completed a recognized third-party certification process. All current, full ASHI members have met their requirements for this new certification. ASHI standards for certification are more stringent than other home inspection organizations. New home inspector members join ASHI as Associates and must accomplish several tasks to become ASHI Certified Inspectors. Associate members must pass the National Home Inspector’s Examination; complete the ASHI Standards of Practice and Code of Ethics education module, undergo an inspection report verification process and conduct 250 paid home inspections. To remain active in the organization, all members must complete a minimum of 20 hours of continuing education each year. ASHI’s organizational structure and membership process were thoroughly evaluated by the NCCA Board for compliance with what it requires of a responsible professional accrediting society. The NCCA is the professional services accreditation arm of the Institute for Credentialing Excellence. ASHI chose the organization because it is a recognized leader in setting quality standards for credentialing organizations. The NCCA requires compliance with 21Standards, each of which has multiple components, in order to grant accreditation status to any association. The National Commission for Certifying Agencies (NCCA) was created in 1987 by ICE to help ensure the health, welfare, and safety of the public through the accreditation of a variety of certification programs/organizations that assess professional competence. Certification programs that receive NCCA Accreditation demonstrate compliance with the NCCA’s Standards for the Accreditation of Certification Programs, which were the first standards for professional certification programs developed by the industry. NCCA uses a peer review process to: establish accreditation standards; evaluate compliance with the standards; recognize organizations/programs which demonstrate compliance; and serve as a resource for quality certification. Certification organizations that submit their programs for accreditation are evaluated based on the process and products, not the content, and are therefore applicable to all professions and industries. NCCA accredited programs certify individuals in a wide range of professions and occupations including nurses, automotive professionals, respiratory therapists, counselors, emergency technicians, crane operators and more. To date, NCCA has accredited over 200 programs from more than 100 organizations.